Photo today: Happy St. Patrick's Day! Apparently, it really isn't easy being green. Kermit is so wise. I walked into the office today looking like this. With two very different shades of green that didn't match. In my defense, I didn't have the jacket on when I went to my car. But when I got to work I realized I might be cold with just a short-sleeved polo shirt on, so I took the jacket from the backseat of the car. Our admin said I looked like a parrot. I was going for more like a demented frog. So I asked her to take my picture. About my shoulder... (thanks so much for asking Angelika!).. it still hurts a little sometimes, especially when I've spent too much time on the computer. It still feels stiff at times, so it's not back to normal yet. I seem to take two steps forward and one step back with my recovery. I think that while I'm running it doesnt' hurt, but it gets stiff after I run. And working too much on the computer doesn't help it. But it feels a lot better than when I first injured it two weeks ago. I found a long-lost friend today on Facebook. He's a friend from my teenage years, and we lost touch a few years ago. He was my boyfriend for a couple of years during high school, and he was part of my church youth group. He's now a church pastor and has a wonderful wife and three kids. Where did the time go??? I got so nostalgic for the teenage years that seem like it was just yesterday. Out of our smallish church youth group, I know of at least two guys who became pastors. It just touches my heart so much that the time my parents spent cultivating the youth group kids were not in vain, that some of them have chosen a similar path of serving the Lord full time. It truly shows the fruits of their labor of love. 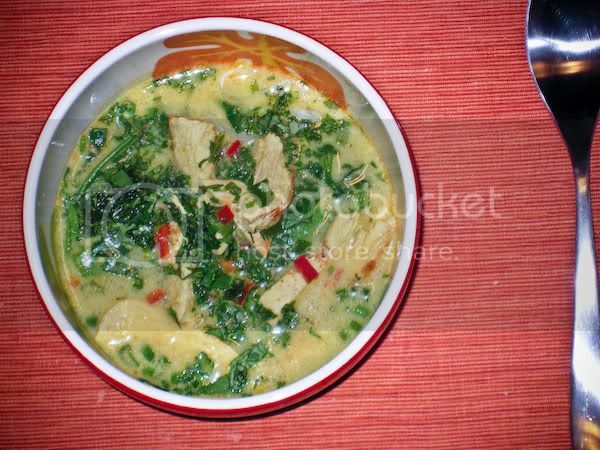 Dinner tonight was Coconut-Curry Chicken Soup. It's Thai-style and it tastes SO fantastic! It's the third time we've made it this year. It's as good or better than any version in a restaurant, it's SO good! I caught up with my Project 365 layouts this past weekend. These pages are going into a photobook at the end of the year, so I try to make the facing pages with similar design and colors. Week 9: Full credits here. Week 10: Full credits here. LOL love the outfit. I love the way you journal on your pictures - it's very cool. I keep meaning to tell you how much I love your 365 photos - but more than that, I love how your light shines and am always telling my husband how cute the photos you post of you and your husband are!! Thank you for allowing others to see and feel your love and light! Hi! You're picture is awesome!! :) I enjoy your blog very much. Would it be ok to ask what font you used on your picture today? I totally LOVE it. :) here's my email babymeow24@aim.com. have a great evening. Good morning Christine! Here in Germany it´s 7.00 am and I have to go to work in a few minutes. I´m marveling your week-pages!! They have a wonderful style. Love that fantastic composition! Have I told you, that I make the sunday school for the kids here in our church? And my younger son will go into the ministry... we shall see. Thanks for the new recipe - it looks and sounds great! Also you in your green jacket. Have a nice day today - what time is it now where you live? I didn't think the jacket and shirt were all that bad..but, the parrot comment was kinda funny! You should have seen the green outfits I saw yesterday at the grocery stores...oh my. (shoulder injury...here's what my chiropractor told me about mine..if you sleep on your side with your hands/ arms under your pillow, you have to stop that. I now have to hold another pillow (not the one under my head) to have a place to put my arms. It's hard to get used to at first, but doesn't bother me now. When I explained to him that I had slept like that for 38 years, he told me that "there comes a time when your body will not compensate any more"..isn't that a nice way of telling me that I was old?? Please tell your Dad thank you for teaching the youth about Christ...what a blessing! The dinner looks very yummy, thank you so much for sharing the recipe! We love Thai-food, so this could definately be worth a try. Hmm.. I would totally wear that combo. Now wondering if people think I don't match. I think you're greens are fab together! And if those shoes of yours are from Target a couple years ago - I have a pair just like them! And - good for you for not cheating on your P365!!! I feel like I'm posting the same things over and over again too - but that is our life and that's what counts!!! 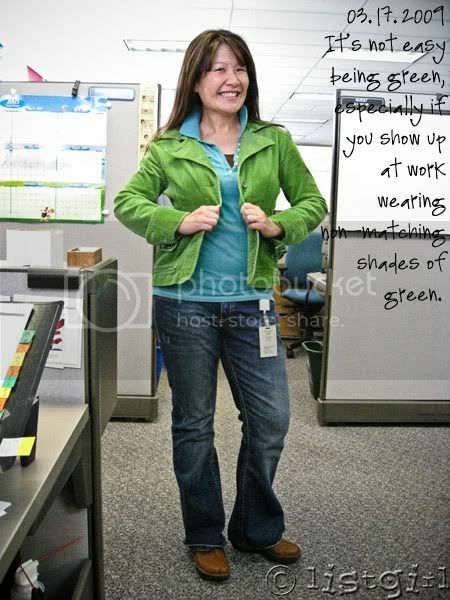 I'm glad you had someone get your photo in your green! You look great...and it was St Patty's day...it didn't matter how many shades of green you had on! That recipe looks amazing. I just made my shopping list from the items I knew I was out of, and bookmarked it. I think I'll be home on Sunday night (I'll be working, at Bible study, or at a band festival the other nights), so for sure it will be on Sunday!! The layouts are fabulous! Great design! I am seriously going to take a few days and do nothing else but get caught up with mine!! Your "green" photo is really great!! :D and i just love your layouts...! !